The Being Well Center promotes ADD/ADHD education through video series, webinars, conferences, articles, books, and personal counseling. Think ADD/ADHD might be a problem for you or someone you know? Take your first step toward peace of mind! ADD/ADHD Basics 101 answers questions like: "What is ADD/ADHD?" "How do I find the right care provider?" "What steps should I take to get an accurate diagnosis?" "What constitutes the correct treatment of ADD/ADHD?" Author Dr. Craig Liden pours his 30 years of expertise treating ADD/ADHD across the lifespan into this 10-Step Guide for families and individuals to ensure accurate diagnoses and effective treatment for ADD/ADHD. 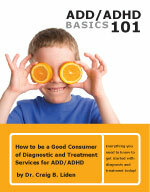 ADD/ADHD Basics 101 reveals everything you need to know to get started with diagnosis and treatment today! Pay Attention! 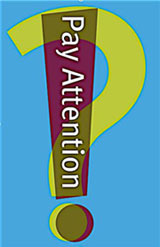 presents a positive and effective approach to the diagnosis, treatment, and understanding of ADD/ADHD. Dr. Liden shares his wealth of practical knowledge about ADD/ADHD and explains how it affects individuals differently depending on their unique individual differences. It is an easy-to-read and navigate comprehensive guide for parents, patients, and professionals. It includes many personal, engaging stories of real individuals who have struggled with ADD/ADHD and have been able to achieve success in all parts of their lives. 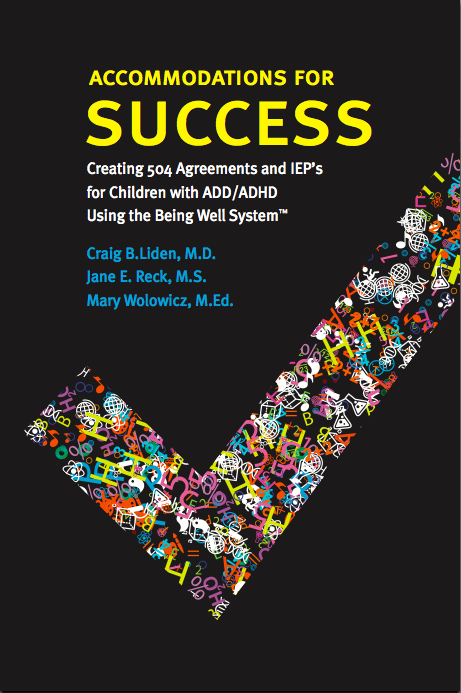 Dr. Liden frequently speaks at schools, community groups, and conferences to share a guided, hands-on workshop based on the principles for creating effective 504 Agreements and IEPs detailed in Accommodations for Success. For more information on Dr. Liden's availability to speak to your group, consult our Workshop and Presentation Services. Introduction to The Being Well Center - Get to know us! Download an overview of The Being Well Center's core philosophy and resources. ADD/ADHD: Treating the Whole Person - Free Download detailing the critical components of how The Being Well Center addresses the whole person in effective ADD/ADHD Treatment. ADD/ADHD Across the Lifespan - Free Download describing the life stage challenges of ADD/ADHD as well as the specific BWC services available to address each stage. The BWC DIfference - A comparison between the services of The Being Well Center, a mental health professional, and a pediatrician's offerings. Invest Now or Pay Later - A look at the across-the-lifespan savings of treating ADD/ADHD effectively now. Long Distance Services - Free Download of The Being Well Center's information for Long Distance patients. Turning a Visit into a Vacation - Area accommodations and attractions for our Long Distance patients. Confidence@College - Information on how the BWC's C@C Program can turn around college failure into a successful graduation. If you are a parent or student planning to go to college in the fall or are having difficulty succeeding at college, download one of our college screeners and identify your barriers to success. Once you find out what the barriers are, we can help you overcome them. Am I Struggling at College? Is My Kid Struggling at College? How to be a Success at College! I have read many books on ADD. Your book discussed many issues with quite a sensitive, matter of fact, confident presentation. I feel that teachers and parents would see the ADD child through different eyes if they read your perspective.